How far you can see Burj Dubai? 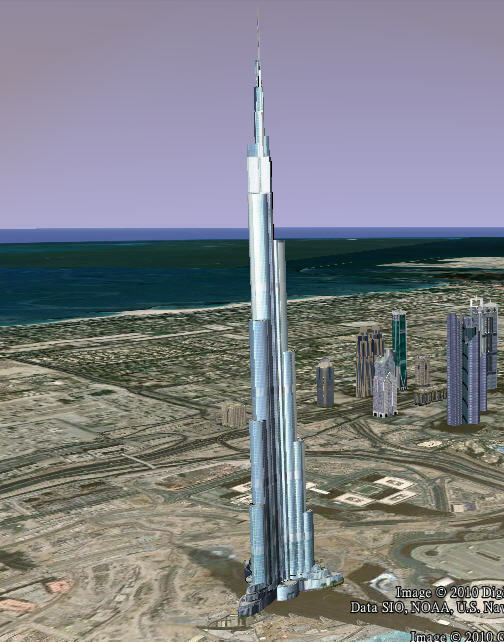 Burj Dubai was January 4, 2010 opened officially replaced as the world’s tallest building, Taipei 101. The first of a series of world record: 826 meters tall, round-layer located one 124th of the world’s highest outdoor observation deck, the highest in a separate building, the largest floor, floor area of the largest, highest elevator, the highest swimming pool (located one 123th floor). And Muslims can closer to Allah, because the 158th floor is expected to become the world’s highest mosque, … Also known as can be seen 95 kilometers away, how this distance is calculated? 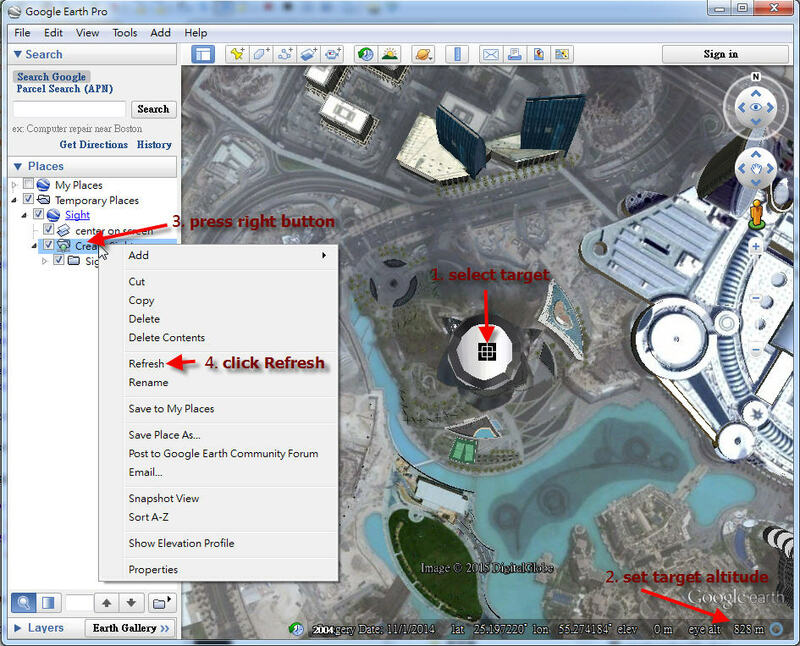 I make the simulation in Google Earth, those who are interested, please read down. In fact, this is a simple trigonometric calculations on the following diagram for illustration. Figure B point represents a height r building, the farthest (d) can be seen as a point A on the ground, O points was geocentric, △OAB is a right triangle. R is the radius of the Earth, the Earth is an ellipsoid, the equatorial radius of about 6378.5km, polar radius of about 6356.9 km, some are average to calculate the radius of about 6371 kilometers. r is about 828 meters to calculate, in terms of kilometers, compared with 0.828km. By extension of this formula, I think to implement as Google Earth. 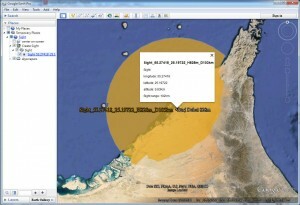 You can download this KMZ file, and operate in Google Earth. 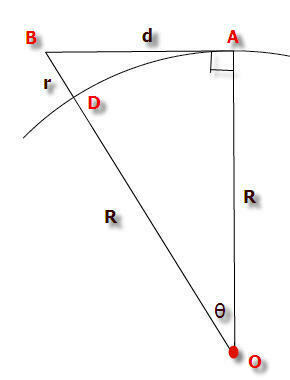 This formula based on the location and height of the center of the screen to produce a cone. So, at first you have to select the target, move the target in center, and set height based on the lower right corner of the marked elevation, and then press “Create Sight” Network link, right-click the “Refresh”, it will produce a “Sight” folder, there is a model landmark labeled with the latitude and longitude, altitude, and the sight distance. You can also rename the landmark, and then save as new file Kmz. 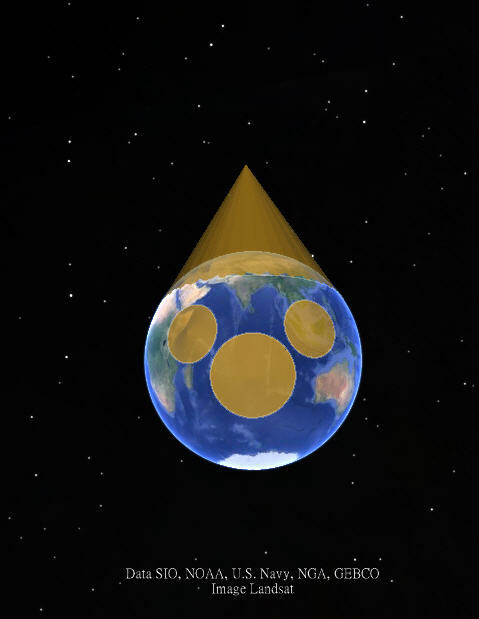 In addition this “Sight generater” generates a cone model of specific height, for entertaining, you can also take it to play with the Earth, wear tall hat above the Earth! For example, I made this below. We can also think about how much height you want, its biggest sight? I wish you happy playing!